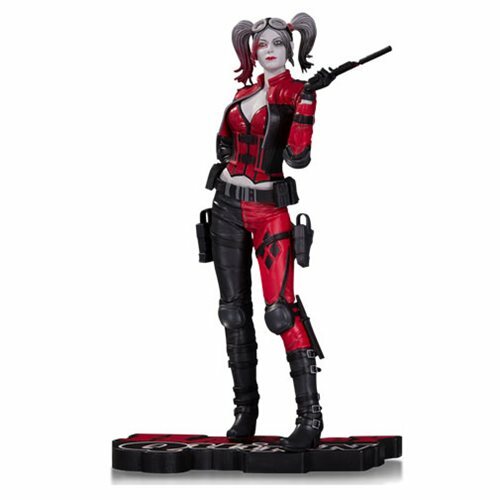 Shopping for Harley Quinn Statues? Limited edition statue sculpted by Steve Kiwus! Harley Quinn in signature colors, loaded with weapons! Derived from the Injustice 2 fighting game. The matching red, white, and black base features her name. Hiya, puddin'! DC Collectibles brings you this Injustice 2 Harley Quinn Red, White, and Black 1:10 Scale Statue. Derived from the Injustice 2 fighting game, the sequel to 2013's Injustice: Gods Among Us, Harley is featured in her signature colors and comes loaded with weapons. She stands approximately 7-inches tall on a matching red, black, and white stylized base featuring her name. Sculpted by Steve Kiwus, she's limited to 5,000 pieces and comes packaged in a closed box. Ages 14 and up.